In April 2014, Nissan opened a new production plant in Rio de Janeiro, Brazil with an annual production capacity of 200,000 vehicles and 200,000 engines. Along with a target of reaching 5% market share in Brazil by 2016, the plant’s opening was aligned with Nissan’s efforts to achieve 8% global market share, part of the “NISSAN POWER 88” five-year mid-term management plan initiated in 2011. 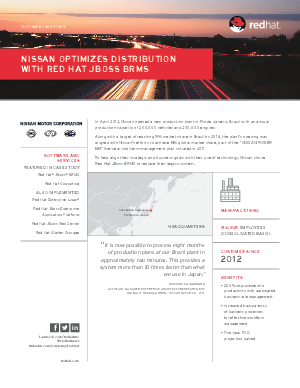 To help align their strategic and business goals with their use of technology, Nissan chose Red Hat JBoss BRMS to replace their legacy system. Download this Case Study to find out more about Red Hat JBoss BRMS.